During your Main Phase: You can Special Summon 1 monster “Fur Hire” from your hand, except “Seal, Strategist Fur Hire”. If a monster “Fur Hire” is Special Summoned to your field while you control this monster (except during the Damage Step): You can target 1 monster “Fur Hire” in your GY; add it to your hand. You can only use each effect of “Seal, Strategist Fur Hire” once per turn. We end off this week Fur Hire with Seal, Strategist Fur Hire. Seal is a Level 4 DARK Beast-Warrior with 1600 ATK and 1000 DEF. Stats are ok for a Level 4. DARK is a great attribute and Beast-Warrior gives you access to Tenki. 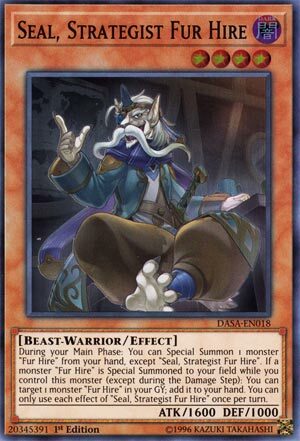 Seal, like all of the other Level 4 or lower monsters Fur Hire, has the Fur Hire effect of summoning a Fur Hire from the hand except itself and being a hard once per turn. When a monster Fur Hire is Special Summoned while you control this card, you can target a monster Fur Hire in your GY and add it back to your hand. Nice recursion effect, especially to fuel your hand for Rafale or Wiz. Most of the small Fur Hires are weak, so they’ll likely be in the GY. This effect is also a hard once per turn so you can’t recur too many cards. Seal is a pretty good card for the Fur Hire deck, but can be dead early on. I say two is fine. Art: 4/5 He looks like the captain to me, despite not being the boss monster. Seals aren’t furry creatures (cute as they can be). Hiring a Strategist could be necessary, so I still appreciate the pun involved here. This guy isn’t terribly weak as we saw earlier in the week. 1600 is still on the low-ish end for Level 4, but respectable. Dark is still fantastic, and Beast-Warrior is appropriate and helpful. You should be familiar by now with the Special Summon a Fur Hire from the Hand (other than himself) during your Main Phase. I love that said effect has nothing to do with being dependent on the Summon (in any manner) of this card itself. When you Special Summon a Fur Hire Monster, you’re then able to Target and recycle a Fur Hire from your Graveyard back to your Hand. This guy honestly only gets better mid to late game, as you’re going to have more Target Monsters to bring back to your Hand.